Jacob Truckenmiller (son of Sebastian Truckenmiller, a soldier) b. aug 29, 1759, Berks Co. d. Delaware Twp., North’d Co. Pa. Aug 23, 1823, buried McEwensville, Pa. will book 2, p.442 at Sunbury, Pa. Children: Jacob, Solomon, George, Samuel. Wife Annamaria b. 1/16/1763 Kirchner, d. 7/27/1843. See DAR Patriot Index P.688. Enlisted in Company B, 131st Infantry Regiment Pennsylvania on 08 August 1862. Commission in Company S, 16th Cavalry Regiment Pennsylvania on 03 April 1865. 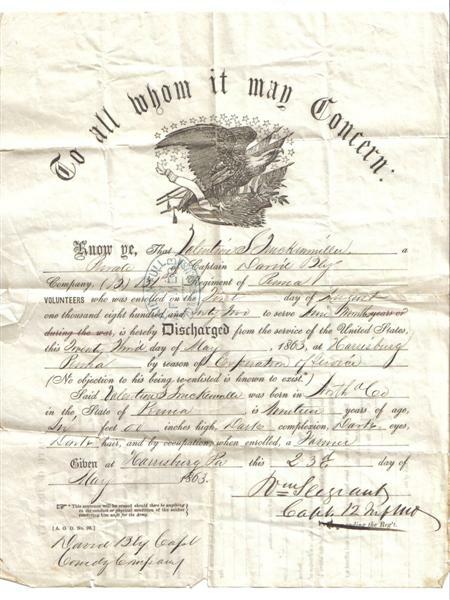 Enlisted in Company I, 28th Indpt Infantry Regiment Pennsylvania on 19 June 1863.